Of the many conversations about video games in the public discourse, two themes have drawn particular attention: the number of women who play games and participate in the gaming community, as well as the question of whether some video games encourage violent behavior by the people who play them. The former drew extensive attention during the ongoing Gamergate controversy, a debate centered on the identity politics of the gaming community. The latter is a recurring conversation in the aftermath of violent events in which the perpetrator was known to play violent video games. Interestingly, men and women are equally likely to assume that most video game players are men regardless of whether they themselves play games. Some 59% of men (and 63% of men who play video games) agree with this statement, nearly identical to the 61% of women (and 57% of women who play video games) who say the same. Young adults are particularly likely to agree that most people who play video games are men. Fully 71% of 18- to 29-year-olds say this, a figure that is substantially higher than every other age group. And while young men are more likely than young women to play games themselves, there is no difference in opinion between the overall populations of men and women ages 18 to 29 about the gender makeup of the gaming population. At the same time, opinions within the gaming community closely mirror those of the general population. Fully 60% of those who play games (and 58% of self-identified “gamers”) agree that most people who play video games are men, and men and women who play games are also equally likely to agree (63% of male game players and 57% of female game players). When it comes to the link between video game violence and actual violence, 40% of Americans agree that “people who play violent video games are more likely to be violent themselves.” A slight 53% majority disagree with that statement, while 7% say they don’t know. In contrast to their views about men in gaming, men and women have highly divergent opinions on the impact of violence and video games. Women are more likely than men to agree (by a 47% to 31% margin) that people who play violent games are more likely to be violent themselves. Men, on the other hand, are more likely to disagree (by a 62% to 44% margin) that there is a link between these behaviors. Along with men, young adults are relatively likely to deny a link between video game violence and real-world violence. For instance, 71% of 18- to 29-year-olds disagree that violent video games are related to violent behavior, compared with 59% of those ages 30 to 49 and 40% of those 50 and older. On the other hand, older adults are more likely to see a link between video games and violent behavior. Almost half (48%) of adults ages 50 or older agree that people who play violent video games are more likely to be violent themselves. Hispanics are more likely than whites or blacks to agree that people who play violent video games are more likely to be violent themselves (52% vs. 39% of blacks and 37% of whites). Those with lower educational attainment and household income are also more likely to see a connection between violent games and actual violence. Most people who play video games do not believe violent games are related to violent behavior – 64% disagree that people who play violent video games are more likely to be violent themselves. 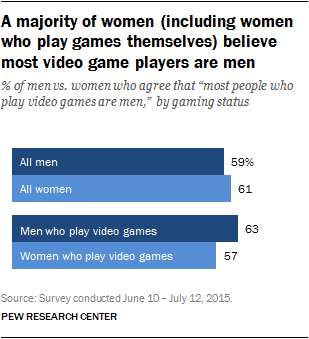 But about a third of game players (32%) agree with this statement, including 26% of self-identified gamers. Much like in the general population, men and women who play video games differ in their opinions on the link between violent play and violent behavior. Female game players are almost twice as likely as male game players to agree that people who play violent video games are more likely to be violent themselves, 42% vs. 22%. On the other hand, fully 76% of male game players disagree with this notion. This compares with 52% of female game players who disagree, a proportion that is substantially lower than their male counterparts, but still a majority.